Le Reve Las Vegas offers audiences an enchanting escape from reality. 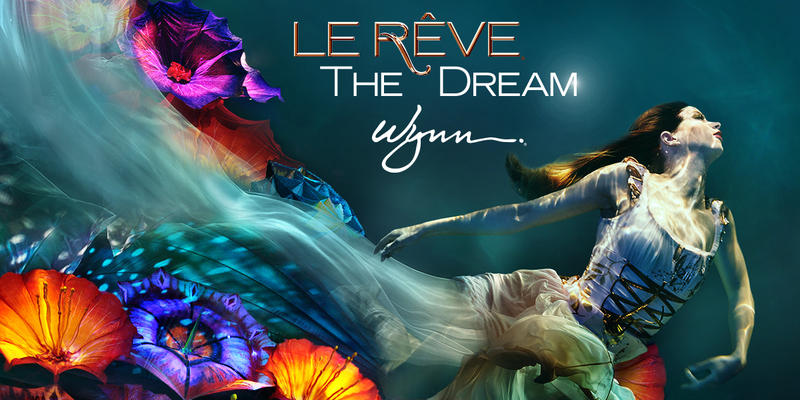 Le Reve is French for “the dream,” and like many dreams, it takes you into a world of surrealism where you should expect the unexpected. It starts with an aquatic theater in the round which submerges 27 feet and has a 15 foot high raised platform for the gymnasts and swimmers. Even those specs don’t limit the boundaries of show creator Franco Dragone’s stage. Performers enter the stage (from inside the pool), swinging through the air as aerialists, and even come running in from the audience. The amazingly imaginative and creative Dragone makes the most of working with a theater in the round. As the show opens, you’ll watch as a couple say their goodbyes on stage. The woman goes to bed, and as soon as she begins falling asleep she and her bed disappear into the aquatic world of the pool. The water swallows her, and the dream begins. You’ll be cued visually as the woman submerges, but also by sound, as the music will change, becoming more intense as you transition from the reality portion of the show into surreality. Other visual effects in Le Rêve include rain pouring from the ceiling, a ring of fire, human pyramids of astounding proportion and creative design. The show features over 2,000 colorful costumes worn by more than 90 gymnasts, synchronized swimmers, tango dancers and acrobats who bring the stage, the pool and the air alive for a fast-paced 75 minutes. Sit anywhere because throughout the theater you are immersed in the action and there are no bad seats in this house. In fact, the farthest audience member’s seat is only about 40 feet from the performance pool, ensuring you won’t be able to forget Le Reve, even after you wake from the dream.